I still remember the scene from Rocky III when the sportscaster interviews Mr. T before the big rematch with Rocky. That is how I would sum up the first 3 weeks of training at 6000+ feet altitude. It was rough. Even with my unexpected 1st in AG and 2nd female overall finish at a local 5K at the 2-week mark (a total fluke which I attribute to the local rockstars flocking to that morning’s 10K and half marathon instead), I found very little reward in running. It just felt so darn hard. My paces were way off what they normally are, and I could not tell if I was just losing it, or if it really was the altitude. Approaching the third week I reached an all-time morale low and actually envisioned hanging up my running shoes for good. I just didn’t want to do it any more. That day I had bombed at a 5-mile moderate tempo run. My lungs burned even though I wasn’t even going that fast. My right knee felt “bunchy” and unstable. My attitude was the pits. That lovin’ feeling was gone. And as I sputtered through several stops and restarts to the finish like a broken down old car, I contemplated what my next pastime would be. What does an ex-runner with a wrecked knee do for fun? Swim? Lawn bowl? Birdwatch? Just when things looked bleak came a ray of light. 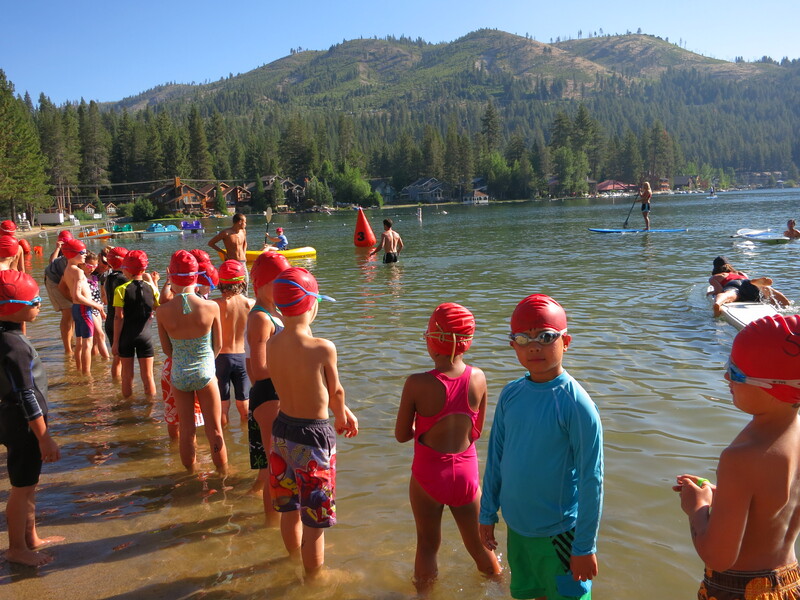 It was called the Donner Lake Triathlon. I didn’t compete in it, but participated in the most fulfilling way: as volunteer, support mom, and cheerleader. My son was signed up for the Kids Triathlon. He had never done one but decided almost on a whim two weeks before the event to go for it. He’s an active, hardy kid who likes sports generally, but had never taken an interest in endurance pursuits except for swimming. I am guessing he was inspired by his daddy’s recent entry into the triathlon world. So for my son’s age group, the event consisted of a 25-yard swim, a 1-mile bike, and a 1/2-mile run. As if his decision to sign up wasn’t surprising enough, right away he came to me and said, “Mommy, can you help me train?” I realized then and there that I love training someone a thousand times more than training myself. He only needed my input on the biking and running. He owned the swim part because he was already in the midst of two weeks of swim lessons, and his group was comfortably cranking out 15 laps at each lesson. For the bike/run part, I mapped out a course that would be a similar terrain to where he would bike and run, and serendipitously the street we live on fit the bill to a tee: mostly flat with gentle hills and exactly 1 mile long. I had him bike the whole mile then work up from running 1/4 mile to 1/2 mile. We trained as often as he wanted, which turned out to be about 5 times total in 14 days. He would bike alone while I waited at the transition area, then get off the bike and run home while I rode his bike. — Our biggest issue was the transition. On Day 1, my son came cruising up, barely braking, tossed the bike sideways onto the road, unclipped and yanked off his helmet and hurled it in the direction of the bike. Yes, the transition needed a little polish if we wanted that bike to last him through the event and beyond. — Me pedaling an 8-year-old’s bike intrigued many a neighbor strolling our street. They smiled politely, I smiled politely, no one uttered a word about the spectacle that I surely was. Since I am only 5’1″, barely bigger than 8-year-old size, I am sure they wondered if I was riding the bike for real or in jest. I thought it was fun to keep them guessing. — The best part of each training day was the reward smoothie, which the whole family got to enjoy. We shared the spoils, no matter who conquered the challenge. My two sons say I make the best smoothies and I gladly accept the compliment. Then the big day came. I got a special front row view of the whole thing as a volunteer course marshal at the bike in/out area. It was amazing to see kids as young as 5 jog up with their bikes — wet, shivering, but undeterred. They hopped right up and motored along. Minutes later they would come cruising back and move onto running. When you watch kids do a triathlon, you realize how a triathlon is really just a magnification of the holy trinity of summer fun. Kids move through it with ease. They don’t stress about it. They jump into it and go as fast as they can. My son had a blast. But having a blast is something you take for granted when you’re 8. As soon as he finished and collected his medal, he asked, “So now can we go crawdad fishing?” Yeah, triathlon one moment, crawdadding the next. Ain’t no big thang. The day after the kids’ event, the grown-ups had their turn: a sprint and an international distance. My husband and several people we knew were racing, so my other son and I headed back to the event area with our big cheering voices and virtual pom poms. We arrived just in time to hoot and holler for my husband’s 7-minute-mile dash to the finish. We treated ourselves to a big recovery breakfast at a nearby diner (remember, we share the spoils), then I threw on my running garb and apprehensively set off for the prescribed 10-miler on my Hood to Coast training plan. Being deep in a running funk, I was not looking forward to my first double-digit run at altitude this summer. So I decided to distract myself by making it a spectating run — i.e., I went in the opposite direction of the international distance triathletes, hoping to bump into folks I knew and cheer everyone on. — Time flies when you’re cheering other runners on, even when you’re running uphill. The power of distraction is potent. — It feels good to draw a smile out of tired athletes. I clapped, held thumbs up, gave the knowing nod and yelled for each one. My favorite sighting was a guy I called “Wig Man.” He was scooting along wearing a huge black ‘fro wig. As if trying to finish a 10K on an 80-degree sunny day after swimming 0.9 miles in a frigid alpine lake and biking 24.8 miles up and down 1200’ wasn’t enough. This race seemed like no big thang to him either. At what point does a pastime morph from something we do for fun to something that feels like work? How do you draw that line between pushing ourselves to grow and pushing ourselves over the edge? Maybe every runner should wear a silly wig to at least one race a year. Or plan to go fishing after another. Just to keep ourselves in check. To remind ourselves not to stress and to have fun. Life is too short to beat ourselves up pursuing a hobby. This entry was posted in inspiration, running by On these feet. Bookmark the permalink. Yep, I definitely go through these running ups and downs. I’ve had a great few years but am just taking it easy-ish and keeping it fun right now. That’s what my mind is telling me and that’s where I’m keeping it until I feel otherwise. I like how you ran your 10-miler against the flow of the race. That’s the reason I love races that are out-and-back style. When you cheer for someone else, it’s much easier to let go of your own discomfort! I really want to try one of these smoothies you make!! First, those kids look adorable in their swim caps. And yes, wearing a wig while running will always be a reminder to not take ourselves too seriously in the moment! I think I might buy a wig just for that.